Storms and a new cold wave have brought natural snow as well as more snowmaking. Conditions are looking great for this weekend's skiing and snowboarding on at the NC Ski Resorts. Appalachian Ski Mountain is open today (10 AM) with 6 slopes and 4 lifts on a base of 32 - 58 inches. Ice skating is open. Beech Mountain Ski Resort is skiing 12 slopes with 4 lifts on a base of 14 - 48 inches. Ice skating and tubing are open. Snowmaking in progress.College Week begins on 2/2. Cataloochee Ski Area will be skiing from the top on 16 trails with 5 lifts on a base of 28 - 48 inches. Tube World will re-open today at 4 PM. Sapphire Valley Ski Area - is skiing on both slopes with 2 lifts and new snow. Call 828.743.7663 for a live report. Sugar Mountain Ski Resort is open skiing on 17 slopes with 6 lifts on a base of 28 - 60 inches. Tubing and ice skating are open for all sessions. Today is a snow day for Ashe, Avery, Carter, Johnson, Mitchell and Watauga county schools. Wolf Ridge Ski Resort - awaiting updates after yeterday's power outage and closure. Get links to all the NC Resorts and ski areas on the NC Ski Resort Guide. Appalachian Ski Mountain is temporarily CLOSED due to thunderstorms today. Snowmaking will continue and great conditions for weekend skiing are predicted. Wolf Ridge Ski Resort is temporarily closed today due to storms and a power outage. The Resort anticipates re-opening on Thursday, assuming power is restored. 12 PM UPDATE: Slopes are now closed due to weather conditions - Cataloochee anticipates re-opening on Thursday. Cataloochee Ski Area will reduce the number of slopes open this morning due to high winds. There will be skiing on 5 trails with one aerial lift and one conveyor lift operating on a base of 28"-48" and a machine groomed surface from 9:00 AM - 10:00 PM. As winds subside, we will open additional trails and lifts. In addition, there will be some features for you to ride on Over Easy, right down from the Snack Shack and serviced by the Easy Way Triple Chairlift. Wednesday is also Family Day and a child 17 and under will receive a free lift ticket when accompanied by a parent purchasing a full price adult day, twilight or night lift ticket. Learn more about Cataloochee SKi Area and the NC Ski Resorts HERE. February 2-10 it's College week at Ski Beech. College students can save BIG this week. Students receive the group rate on tickets by showing their college ID in the Group Sales office. Join us for live music and competitions on both weekends. The Bathing Beauty competition will be held on Feb 2. Participants can flaunt their stuff in a bathing suit as they cruise the Play Yard Slope from top to bottom. Males and females are encouraged to wear their 1-pieces or bikinis - for a family friendly event. Costumes will be judged based on outrageousness and originality combined for a total score that will determine the winner. Registration will be held the day of the event from 9 AM to noon and the event activities start at 12:30 PM. A $15 registration fee is required and includes a lift ticket. 1st, 2nd, and 3rd place prizes will be awarded. So get creative and design your costume. Get a link for more details about College Week and Beech Mountain Ski Resort on the NC Ski Resort Guide. February 2 - Red Bull ThingamaJIB at Appalachian Ski Mountain. This season ATP will be bringing the Red Bull ThingamaJIB back for its second season, with a whole new concept. Expect brand new repurposed features all over the place with a unique and progressive setup for this one. Get a link for Red Bull ThinamaJIB and other Appalachian Ski Mountain events on the NC Ski Resort Guide. January 27 SFTC Big Air at Appalachian Ski Mountain This is the highlight the “triple crown” of park events once again, with Rail Jam, Big Air, and Slopestyle competitions throughout the entire winter. All events will be scheduled for the Day Session. ATP will be partnering each SFTC event with a major title sponsor to provide prizes, product, and support for everyone involved. Get a link and learn more about Appalachian Ski Mountain HERE. January 26 - Dragon Go Big or Go Home at Appalachian Ski Mountain A unique rail jam that is FREE to enter and offers great prizes, including $100 cash for both Standout Ski and Standout Snowboard, as well as Dragon goggles that will be awarded on the spot to shredders that are killing it. Unique features will be set up for the event, creating a versatile layout with many options to allow creativity. Get a link for Appalachian Ski Mountain and ski lodging and rentals on the Blowing Rock NC Visitor Guide. Cooler temperatures continue allowing for more snowmaking and deeper bases. This weekend will be a great time to visit the NC Ski Resorts and hit the slopes for skiing, snow boarding, tubing and ice skating. Appalachian Ski Mountain is open today with 9 slopes and 6 lifts on a base of 44 - 63 inches. Beech Mountain Ski Resort is skiing 10 slopes with 4 lifts on a base of 18 - 50 inches. Ice skating and tubing are open. Snowmaking in progress. Cataloochee Ski Area will be skiing from the top on 16 trails with 5 lifts on a base of 25 - 45 inches. MILITARY APPRECIATION DAYS today and tomorrow. Tube World will re-open today at 4 PM. Sapphire Valley Ski Area - . Call 828.743.7663 for a live report. Sleet and / or snow storm warnings for Thursday evening and Friday. Sugar Mountain Ski Resort is open skiing on 16 slopes with 6 lifts on a base of 26 - 60 inches. Tubing and ice skating are open for all sessions. Snowmaking is in progress. Wolf Ridge Ski Resort is open today with regular hours skiing 9 slopes with 1 lift on a base of 40 - 72 inches. Snowmaking has been in progress for the last 48 hours.Tubing is open. January 24 - 27 15th Annual Winterfest Join the Village of Blowing Rock to celebrate the fun side of winter at this annual family event. From the Wine Auction, ice carving and Live Bluegrass, to the Chili Cook-Off, Kids' Activities and the Polar Plunge in Chetola Lake, there's something for everyone. Get a link for Winterfest and other Blowing Rock NC winter events and ski lodging HERE. January 24-25 Military Appreciation Days at Cataloochee Ski Area Cataloochee supports the armed forces by offering a special reduced rate for military personnel and their families . Valid i.d. is required. This special package is only $27 per person and includes a 1 1/2 hour lesson, lift ticket for either day, twilight or night skiing and rental equipment. The combined savings is $56 per person over Cataloochee's regular rates. Find Cataloochee ski lodging and other local information on the Maggie Valley NC Visitor Guide. With natural snow of 4 - 12 inches and cooler temperatures allowing snowmaking to continue through the night, the Martin Luther King Jr. Holiday Weekend will be a great time to visit the NC Ski Resorts and hit the NC slopes. Appalachian Ski Mountain is open today with 10 slopes and 6 lifts on a base of 12 - 22 inches. Snowmaking continues overnight creating peak season conditions this weekend. Beech Mountain Ski Resort is skiing 12 slopes with 6 lifts on a base of 14 - 42 inches. Ice skating and tubing are open. New snow of 12 inches with snowmaking continuing overnight throughout the Holiday weekend..
Cataloochee Ski Area will be skiing 12 trails with 5 lifts on a base of 16 - 30 inches with 6 inches of new natural snow. Tube World will re-open today from 10 AM -10 PM. The top of the mountain is now open and additional terrain will be available as snowmaking continues. In addition, there will some features for you to ride on Over Easy, right down from the Snack Shack and serviced by the Easy Way Triple Chairlift.There will be three sessions of skiing, day skiing from 8:30am-4:30pm, twilgiht skiing from 1pm until 10pm and night skiing from 6pm until 10pm. Holiday rates are in effect through Monday, January 21. Sapphire Valley Ski Area is temporarily closed with snowmaking in progress. Tube Hill is open today. Call 828.743.7663 for a live report. Sugar Mountain Ski Resort is open with 10 inches of new, natural snow. Skiing today on 15 slopes with 6 lifts on a base of 11 - 43 inches. Tubing and ice skating are open for all sessions. Snowmaking will continue. Wolf Ridge Ski Resort is open today with regular hours skiing 6 slopes with 2 lift. 6 inches on a base of 34 - 39 of natural snowfall with snowmaking in progress. More trails will open as snow accumulates. Cataloochee Ski Area offers three sessions of skiing today, day skiing from 8:30am-4:30pm, twilgiht skiing from 1pm until 10pm and night skiing from 6pm until 10pm. In addition to the regular twilight and night hours of Tuesday through Saturday, Cataloochee will also day, twilight and night ski on Sunday, January 20. Holiday rates are in effect through Monday, January 21. With natural snow of 4 - 8 inches fell yesterday with more predicted for Friday. Cooler temperatures will allow snowmaking tonight and the Martin Luther King Jr. Holiday Weekend will be a great time to visit the NC Ski Resorts and hit the NC slopes. Appalachian Ski Mountain is open today with 6 slopes and 6 lifts on a base of 10 - 21 inches. Beech Mountain Ski Resort is skiing 10 slopes with 4 lifts on a base of 14 - 38 inches. Ice skating and tubing are open. New natural snow of 12 inches with more on the way and snowmaking in progress. Cataloochee Ski Area will be skiing 8 trails with 3 lifts on a base of 12 - 24 inches with 6 inches of new natural snow. Tube World will re-open today at 4 PM. Sapphire Valley Ski Area is temporarily closed with snowmaking in progress. The Valley hopes to open the tube hill Saturday, January 19th, and the ski hill on Sunday, January 20th, weather permitting. Call 828.743.7663 for a live report. Sugar Mountain Ski Resort is open with 10 inches of new, natural snow. Skiing today on 14 slopes with 5 lifts. Tubing and ice skating are open for all sessions. Wolf Ridge Ski Resort is open today with regular hours skiing 6 slopes with 1 lift. 6 inches of natural snowfall yesterday with snowmaking in progress. More trails will open as snow accumulates. January 18 - Appalachian Ski Mountain is open today with natural snowfall yesterday and more predicted for today. Snowmaking will resume tonight with the cooler temperatures. Skiing and boarding on 6 trails with 6 lifts and skating is open for regular sessions. Additional slopes will open as snowfall and snowmaking continue. Get a link for Appalachian Ski Mountain and all other North Carolina ski slopes on the NC Ski Resort Guide. January is Learn to Ski and Snowboard Month and Cataloochee Ski Area celebrates by offering you big incentives to learn to ski or ride this season. You can purchase your all inclusive learn to ski or ride package offering lesson, lift and ski or snowboard rental for anyone ages 8 and above on any non-holiday Monday through Friday for ONLY $29.00! The Lesson is required. TICKETS MUST BE PURCHASED ON LIFTOPIA.COM and can not be purchased at the area at that price. Cataloochee has additional opportunities for learning to ski or ride with free beginner lessons included will all Cataloochee rentals any non-holiday Monday through Thursday, all season long. Snow is on the way and it's going to be a great weekend to Ski NC! With natural snow of 6 - 8 inches in the forecast for Thursday and Friday along with cooler temperatures that should allow more snowmaking, the Martin Luther King Jr. Holiday Weekend will be a great time to visit the NC Ski Resorts and hit the NC slopes. Cataloochee Ski Area will be skiing 3 trails with 2 lifts on a base of 12 - 24 inches. Tube World will re-open today at 4 PM. Beech Mountain Ski Resort is skiing 6 slopes with 4 lifts on a base of 10 - 38 inches. Ice skating and tubing are open. Snowmaking will begin as soon as temperatures allow. Wolf Ridge Ski Resort will reopen today with regular hours skiing 4 slopes with 1 lift. Rain is expected to turn to snow early this afternoon with growing intensity through the evening. Forecasts range from 4"-12" total accumulation by morning. Sapphire Valley Ski Area anticipates reopening with regular operations on Friday. Snow is on the way the the Valley with colder temperatures allowing more snowmaking. Get links for all the NC ski Resorts and areas on the NC Ski Resort Guide. Ski Condo Rental on Sugar Mountain - Winter Ski Special for Mid-week - $175 night between 1/12 and 1/31. 3 bedrooms, 3 baths, sleeps 6. Sugar Mountain Reserve Condo with beautiful mountain views. Deck, fireplace, Internet. Ski Slope access. on the NC Ski Resort Guide. In celebration of National Learn to Ski Month (January) Beech Mountain Resort is offering the second annual Learn to Ski Poster Contest for 3rd through 5th graders. The deadline for submission is January 31, 2013. Winners will receive a beginner ski and snowboard package. CLICK HERE to go to the Beech Mountain Resort website. January 18-2 Martin Luther King, Jr. Holiday Weekend at Cataloochee Ski Area Holiday rates will be in effect. In addition to the regular twilight and night skiing schedule of Tuesday through Saturday evenings, there will also be twilight and night skiing on Sunday, January 20. 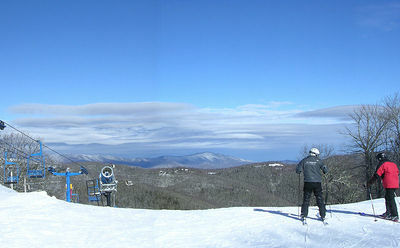 Head for Cataloochee Ski Area in Maggie Valley NC fo MLK Weekend Holiday and Ski NC. Enjoy the great skiing that is Cataloochee's specialty. For over 40 years, Cataloochee skiers have enjoyed the best of North Carolina skiing with exciting slopes, winding trails and a friendly, helpful atmosphere making the Cataloochee Ski Area experience unique. Find ski rentals for the MLK Weekend HERE. Get additional local information for Maggie Valley Lodging, events and attractions on the Maggie Valley NC Visitor Guide. Appalachian Ski Mountain: OPEN with skiing and boarding on 10 slopes with 6 lifts on a base of 22 - 44 inches. Ice Skating open for all sessions. Ladies Park Session from noon - 5 PM. Beech Mountain Ski Resort: OPEN with 10 trails and 5 lifts on a base of 12 - 44 inches. Ice Skating is open for all sessions. Cataloochee Ski Area: OPEN 8:30 AM - 4:30 PM on 11 slopes with 5 lifts on a base of 18-40 inches. Tube World will be open from 4 PM to 10 PM. The Sapphire Valley Ski Area: OPEN on both slopes with a base of 24 - 46 inches. Sugar Mountain Ski Resort: OPEN for all sessions with 13 slopes, 4 lifts and a base of 10 - 40 inches. Ice skating and snow tubing open. Wolf Ridge Ski Resort: OPEN with 8 slopes and 2 lifts on a base of 24 - 39 inches for skiing, boarding, tubing and ice skating. January 12 Appalachian Ski Mountain offers the first “Ladies Park Session” of the season – which will be held during the day this year. Burton will be hosting this event, and providing demo product for ladies to sample, as well as offering helpful coaching and trick tips to anyone interested. Appalachian Terrain Park will construct a custom park setup located in AppalTop Terrain Park tailored with women in mind. Expect some great progression jumps for getting comfortable leaving the ground, as well as small, low consequence boxes and rails designed for learning new tricks. The event is open to both snowboarders and skiers. Registration for the Session is FREE with purchase of a ski ticket, and will be held in the Alpine Ski Shop from 9am – 11:30am. The event will start around Noon, and should last from 12-5 PM. For women interested in demoing the latest Burton boards for free, the only items needed will be a Drivers License, and a Credit Card. After the park session, Burton also has some prizes that will be raffled among all participants. For all Ladies Park Sessions, a custom terrain park area with features specifically designed for learning and progression is setup and offered to ladies exclusively. Trick tip coaches will be on hand for each event to offer advice and guidance if needed. These sessions are open to women of all ages and ability, both skiers and snowboarders. Get a link for more details about Appalchian Ski Mountain and Ladies Park Sessions on the NC Ski Resort Guide. January 12 - ASM hosts the region’s first Burton Riglet Park Tour, which is a mobile product demo and mini-snowboard park geared towards introducing children as young as 2 to the sport of snowboarding. A custom children’s learning terrain area will be provided at the base of ASM and Burton Snowboard experts will be offering a free “introductory terrain park experience” for children ages 2 to 6. The idea is to get children comfortable on the snow, and moving over small changes in terrain – establishing sound fundamentals for park riding. This is a FREE event and will be held in the Alpine Ski Shop throughout the day. There will be 2 main sessions of park orientation in the Riglet Terrain Park" from 10 AM -12 noon, and from 1PM – 3PM. Sessions should last around 30-45 minutes for each child. Parents are encouraged to watch the action from the front slope entrance or from the observation deck on the 2nd level of the lodge. Helmets are required for children to participate. Get a link for more information about Appalachian Mountain's Burton Riglet Park Tour on the NC Ski Resort Guide. January 9 - Tube World located in Maggie Valley, across from Ghost Town in the Sky, four miles from Cataloochee Ski Area will be operating from 10 AM until 6 PM with 1 hour 45 minute sessions available beginning at 10 AM. Cost for tubing is $25 and you must be 42" to ride alone. There is no two person tubing at Tube World and tubing is on a first come, first served basis with some sessions will selling out. Should the session you wish to tube be sold out when you arrive, you may purchase a session for later in the day. Wee Bowl, the children's snowplay area, will not be open until snowmaking allows. Get a link and more details for Tube World on the NC Ski Resort Guide. Beech Mountain Ski Condo - Getaway this weekend to Ski Beech! 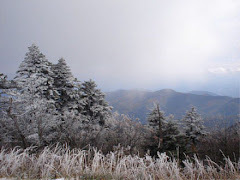 Learn more about Beech Mountain NC HERE. January 12 NC Snowshoe Championship This 2nd annual event at Beech Mountain includes a recreational and competitive 5k run, a kids snowshoe scramble, and a competitive 10K State Championship qualifier for the National Snowshoe Championship to be held in Bend, Oregon. Previous experience not necessary, and there will be snowshoe rentals available. The snowshoe event is sponsored by the Town of Beech Mountain Parks and Recreation Department. January 8, 12 PM in the Last Run Lounge at Sugar Mountain Ski Resort - The Annual Septuagenarian Party wil be held for anyone 70 and older. Present a photo ID to qualify for complimentary skiing/riding at Sugar Mountain Resort from the Sugar Mountain Resort administration office, located on the second floor of the main lodge building. A season pass will be issued to you for a processing fee of $10. You may also chose to receive a daily ticket at no charge. Every January Sugar recognizes the wonderful contribution seniors make to the sport of skiing by throwing a party. Get a link for the Septuagenarian Party and other events at Sugar Mountain Ski Resort on the NC Ski Resort Guide. January 9 - 11 High Country Nordic Association 3rd Annual Telefest Downhill Nordic skiers celebrate the beautiful Telemark turn at Beech Mountain Resort. The "telemark", is a dipping, dance-like turn that Nordic skiers can execute, because only their toe is attached to the ski binding. In its third year, the event is now the leading regional opportunity for "tele-ski" enthusiasts to meet, ski together, improve their skills, and win great prizes. Prizes are provided from a long list of outdoor gear suppliers. Telefest events include a poker run, skinning race (skin-up and race down through gates), beacon search, best costume, switch riding, best tele-trick. Learn more about Beech Mountain and other NC ski areas on the NC Ski Resort Guide. BEECH MOUNTAIN, N.C. - In conjunction with national Learn to Ski and Snowboard Month in January 2013, the Town of Beech Mountain is offering a basic course. "Skiing 101 at Beech" is a program that provides one night's lodging, equipment rental, helmet rental, full-day lift ticket, and a beginner skiing or snowboarding lesson at Beech Mountain Resort. The month-long program is available Monday through Friday to anyone age eight or older. Cost of enrollment is $101 per person, double occupancy required. "Skiing and snowboarding can be intimidating if you haven't tried them before, so we're offering a learning experience that's easy, safe and fun," says Talia Freeman, marketing director for Beech Mountain Resort. "Additionally, this program provides an affordable entry point for folks who don't want to make a significant upfront investment." Registering for "Skiing 101 at Beech" is simple. Just contact any of the participating lodging options listed at: www.BeechMtn.com/skiing101 and ask for the Skiing 101 package. The accommodation will book your room and provide a voucher at check-in to be redeemed at the ski resort for a lesson, equipment rental, helmet rental, and lift ticket. So grab a friend or family member and take advantage of this opportunity to venture into a new sport during national Learn to Ski and Snowboard Month. Further details are available by calling (800) 468-5506. Appalachian Ski Mountain: OPEN with skiing and boarding on 10 slopes with 5 lifts on a base of 18 - 46 inches. Ice Skating open for all sessions. Regular weekday rates. Beech Mountain Ski Resort: OPEN with 11 trails and 4 lifts on a base of 14 - 46 inches. Snowmaking as temoperatures allow. Ice Skating is open for all sessions. Cataloochee Ski Area: OPEN 8:30 AM - 10:00 PM on 13 slopes with 5 lifts on a base of 16-43 inches with snowmaking planned for today. Tube World will be open from 4 PM to 10 PM. The Sapphire Valley Ski Area: OPEN on both slopes with a base of 16 - 32 inches. Sugar Mountain Ski Resort: OPEN for all sessions with 13 slopes, 6 lifts and a base of 12 - 49 inches. Ice skating and snow tubing open. Natural snow and snowmaking in progress. Wolf Ridge Ski Resort: OPEN with 6 slopes and 2 lifts on a base of 28 - 39 inches for skiing, boarding, tubing and ice skating. January 4-6 Winterfest The town of Beech Mountain and Beech Mountain Resort will present a number of events throughout the weekend. The town of Beech Mountain will host the North Carolina State championship snowshoe race. Some of the weekend's events include the the annual bathing beauty contest, the Village Rail Jam, the Cardboard Box Derby’s Visual Competition, huge sales on apparel and equipment and live music. Get a link for WinterFest and other Beech Mountain Ski Resort events on the NC Ski Resort Guide. December 31 - Appalachian Ski Mountain celebrates New Year's Eve with " The High Country's Best Midnight Fireworks Celebration. Enjoy torchlight skiing, moonlight ice skating and more. Restaurant specials will be available from 9 PM to midnight. Natural snowfall plus last night's snowmaking have produced ideal conditions for great holiday skiing and winter fun! December 31 - Sapphire Ski Are will be open from 9 AM to 5 PM with both slopes and lifts open for lots of New Year's Eve family fun. The base is 12 - 24 inches including recent natural snowfall. January 1 - The Slopes are open from 9 AM until 9 PM. Visit the Sapphire Valley Outdoor Ski Shop for gloves, goggles and everything you need for your day on the slopes. - Cataloochee Ski Area is open 8:30 AM - 10:00 PM on 15 slopes with 5 lifts on a base of 18-47 inches with snowmaking in progress. Tube World will be open from 10 AM to 10 PM. - Beech Mountain Ski Resort is open with 11 trails and 4 lifts on a base of 16 - 48 inches. Ice Skating is open for all sessions. - Sugar Mountain Ski Resort is open for all sessions with 14 slopes, 6 lifts and a base of 14 - 54 inches. Ice skating and snow tubing open. - Appalachian Ski Mountain is open with skiing and boarding on 10 slopes with 5 lifts on a base of 20 - 48 inches. Ice Skating open for all sessions. - Wolf Ridge Ski Resort is open with 6 slopes and 2 lifts on a base of 30 - 40 inches for skiing, boarding, tubing and ice skating. - Sapphire Valley Ski Area is open on both ski slopes with a base of 16 - 32 inches. Tubing is open. Get links for ski resort updates and details on the NC Ski Resort Guide.